TENMAT’s Firefly 108 Fire Stop Block is a unique, compressible and fully intumescent alternative to traditional fire pillows. 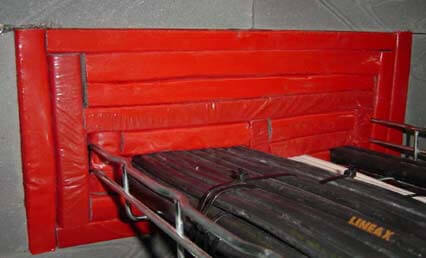 The Fire Stop Block can be supplied in up to 1 metre lengths and can be cut to size on site. This ensures maximum flexibility and minimum wastage compared with intumescent fire stop pillows. The material can be installed within and around various openings and electrical penetrations including cable trays, cable baskets and both PVC and steel electrical cable trunking where intumescent fire pillows are traditionally used. The product is easily identified on site and can be added and removed as required making this an ideal option for both permanent and temporary fire protection applications. This electrical firestopping solution provides up to 120 minutes fire integrity and insulation rating (EI120).